Remember when I created a scale of celebrity embarrassment? I’ve realized that what was weighing on my mind was my recent humiliation in front of NBC news anchor Tom Brokaw. You might be wondering, “What could be worse than the time WendyB asked Tom Brokaw if he knew there was a gang of Tom Brokaws on Family Guy?” How about REMINDING him that I was the one who asked him if he knew there was a gang of Tom Brokaws on Family Guy? Yep, that earns at least an Eddie Money on my scale of celebrity shame. On June 2, MrB and I attended the Livingston Awards for Young Journalists at the Yale Club. MrB was there to accept the Richard M. Clurman Award for being a great mentor to young journalists. Tom Brokaw was one of the Livingston judges. After the celebratory lunch, I wanted a picture of my MrB and the news anchor MrB. I stopped Tom Brokaw (note: all famous people I meet must always be referred to by their full name) and said, “Let me get a picture of you and MrB,” while frantically waving my MrB over. Tom Brokaw said, “Okay, who’s taking our picture?” Tom Brokaw thought I was a TV-news groupie asking him to pose with ME for a picture. I blurted a few words like, “No! You! Husband!” while waving harder at my MrB, who was busy posing for pictures with young journalists. After a few minutes, I saw that MrB wasn’t going to be released by the young journalists and said to Tom Brokaw (really, I said this, word for word), “I’m more photogenic than him anyway. Let’s take the picture together.” I plopped the camera in the hand of a guy who was speaking with Tom Brokaw and struck my pose. As I was doing this, I decided to explain to Tom Brokaw that we’d met before and that I am married to MrB, whom he knows quite well. For some reason this came out as, “I was the one who asked you about Family Guy? Um, MrB sent you the link? You thought it was funny?” Then CLICK! My awkward moment was captured for posterity. 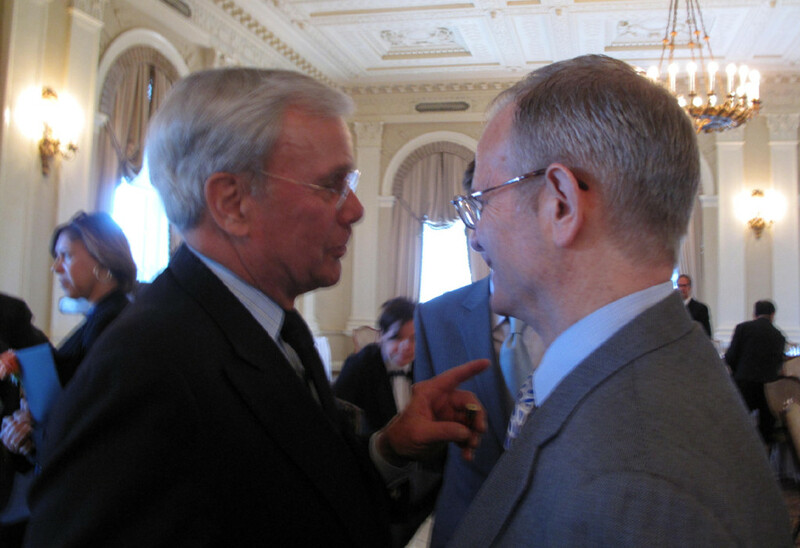 I eventually stopped writhing in shame long enough to take a candid of MrB with Tom Brokaw. MrB: Seriously? There’s a crazy lady here? Tom Brokaw: Yes, she’s over there [pointing at WendyB]. Turning my back on the ladder to success. Here’s a picture of me wearing the same dress in 2003. L.A. hairstylists often hear "Blow it out straight" as "Make it fluffy." So, how would you rate the Peeps comment on my scale of celebrity embarrassment? I don’t know what I like more, the fictional conversation you created or your cleavage at the luncheon. I’m sure the crowd enjoyed that one though! From my experience, celebs totally love genuine people like yourself who act a little bit goofy sometimes. Tommy B. was a sweetheart, right? I met him once when we hosted him for an author appearance and he was so gracious. Hold up. Tom Brokaw?! I could’t make it past Tom Brokaw. Loving his pocket square. And your sesky dress! You do lead such an exciting life with your Mr B, Mentor to the Stars. Love your frocks in both snaps. I think your ‘do looks quite nice all fluffed out. Cheerio. FF x PS I’m not sure if you have clients here, but you should action a visit to Australia pronto. Bring Mr B. You’d enjoy the People and scenery. You may have been embarrassed but at least you looked stunning at the same time in that Roland Mouret! The neckline looks amazing with the Cleopatra necklace. Ooh Tom Brokaw! Seriously, celebrities probably get really wacky people coming up to them and you are not one of them. 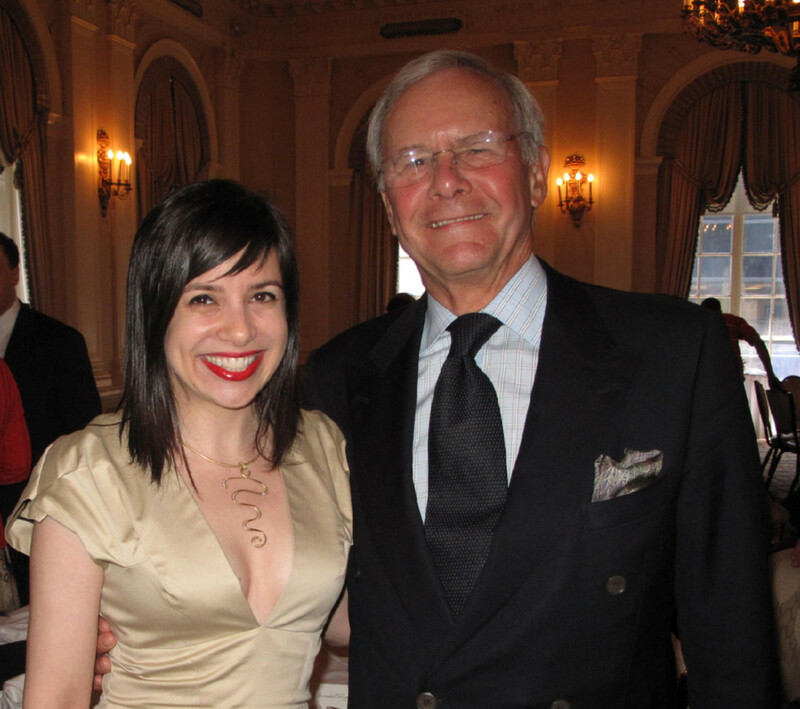 Brokaw probably remembers you as the styling lady that kept talking about Family Guy and kept sipping the wine/champagne himself because he was talking to a million people. Oh wow, you look amazing in that Roland Mouret dress! It took me a while to realise that last photo was you and not some imposter! Love this anecdote, you certainly know how to tell them on here and in real life! Bottomless champagne glasses are most definitely a danger, haha. I will discard the embarrassment because it is so damn highlarious. That Tom Brokaw anecdote is HIGHsterical, and the Versace dress TDF! Love the story behind the shot. And Cleopatra…stunning. When you get tired of looking at it, you can send it my way. Cleavage is always appropriate…it distracts people from my stupid drunken comments. No matter what, Wendy, you are memorable! I don’t think you have anything to be embarassed about (including that fab cleavage, girl). Love that pretty Versace dress and I’m so jealous that you fit into clothes from 7 years ago! Way to stay in shape 🙂 Sounds like you and Mr. B make quite the dynamic duo! 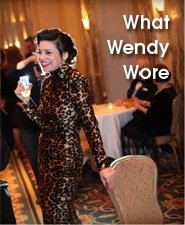 Wendy B you are smokin’ hot in that gold dress and Cleopatra necklace! Oh Wendy, I feel that we are soul sisters. I would TOTALLY have reminded Brokaw about the Family Guy thing. It would’ve happened before I even realized. And hopefully Steve has a sense of humor. I’m giving the peeps comment a 3 out of 10 on the Celeb Embarrassment scale. Barely even registers. I think that’s between a Gwyneth and an Eddie. It’s too cute to be a full-on Eddie, cause we are talking Peeps here. You should be the professional embarrassing celeb person, daily encountering celebrities and asking them about their knowledge of Family Guy and Peeps. you crack me up, <3 you! I’m going to give it a 4 out of 10 on the Celeb Embarrassment Scale; it was funny and cute. However, you get a 10 out of 10 on the outfit awesomeness/hotness scale! Beautiful dresses and the cleavage looks fantastic! LOL I enjoyed this post so much, from the outfit shots to your gorgeous smile to your celebrity encounter recaps. You never fail to me make giggle. You shouldnt be embarassed, not when you look so fabulous. Love both looks! well you look fab! and i bet tom brokaw will remember you FOREVER! that’s what i love about you…you’re just who you are and awesome at being you. Hilarious!! I love that you’re yourself around celebs. I get the extremely shy dork face. is the cleavage kelly bensimon level? Never change Wendy – never change! And you look gorgeous in that printed dress and appear to be getting better looking every year. This really is not fair – I must protest! Peeps comment rates an ‘Eddie Paltrow’ on your scale? It started off sounding more embarrassing than it really was? You needed a neckline like that anyway. How else could you have displayed that stunning Cleopatra necklace? LOVE the Louboutin cork heels. My anti-spam word is DENMARK! Yeah! I think it’s the universe suggesting I will finally meet my Danish husband! Wow, I have a lot of catching up to do. I think reading your blog will fill my Saturday morning. I want to know what I’ve missed. 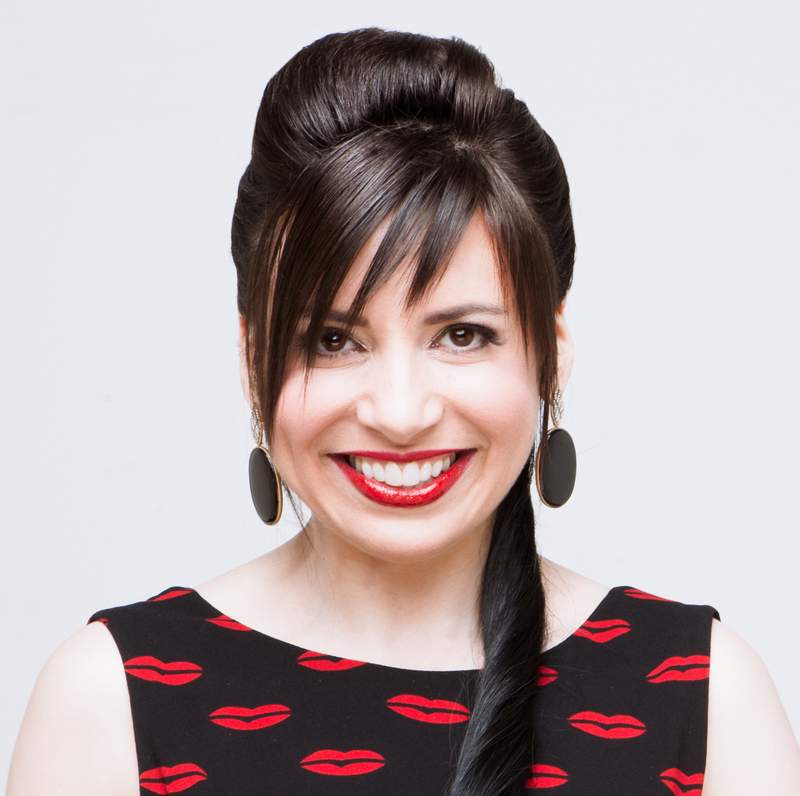 other than being the most one of the most fabulous bloggers i know, you are also the funniest. i love that you wear pieces more than once, and years apart. amazingness! I adore the colors and prints of this dress Wendy! 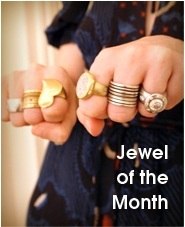 I just saw you at Winnie’s blog! So cool you met each other! You know, these are EXACTLY the kinds of random things I find myself blurting out at people sometimes. If I didn’t want to kick myself so much afterwards, I think I would actively enjoy the facial expressions of the other party…. at least you have a great sense of humor about your awkward moments with Tom! and you looked great too! LOL! You looked so pretty here I’ll bet my $50 he probably didn’t even notice what you said. And even if he did, he probably didn’t mind. Really, that pic was from way back ’03? Wow, you never aged! In fact, you look even younger now with the hairstyle! Congrats to Mr. B and as for your peeps comment-I love it so much because it is something that I would say. I often say things and then realize that it would have been better had I not. But you were just being you and that is why I love you so-because you are Wendy B wether people like it or not. It’s impossible that Tom B could evah forget you. lol Wendy you are so awesome. He should be absolutely flattered. You are fearless and I love it! Nothing compares to my Eddie Money embarrassment. You look great in that dress. And the cork shoes and clutch, how brilliantly summery! I am in awe of both situations. Brokaw?! The Brokaw is amazing, that is all that needs to be said. Barely registers. What’s that, a Gwyneth? I bet Tom was charmed. I can’t give you TOO high a rating on the embarrassment scale. HA! I ADORE that Cleopatra necklace. It looks awesome on you.